Aluminum rims are made as an extrusion, curved into a hoop and then connected together at the seam, usually opposite the valve hole. The seam area is never exactly perfect; there is commonly a very slight difference in width or alignment. Excess welding material is commonly ground down too far, creating a slight hollow; or the two ends of a pinned rim may be slightly out of alignment. When a brand-new rim is first used (with a rim brake), the brake may pulsate annoyingly. Generally, this goes away after a couple of hundred miles of use, as the brake shoes wear down the irregularity of the seam. Sometime in the 1990s, Mavic introduced its "SUP ® " rims (Soudé Usine Process: “Factory Welded Process”. The French version isn't all French: it's marketeerese -- "process" is English. Mavic could expect a visit from the French Language Police any day now... see my article "Derailer, not Derailleur"). But anyway. These rims are made with an extrusion slightly wider than normal, with extra thickness on the braking surfaces. Mavic uses a welded seam (not normally practical on a thin-walled hollow-section rim) and then, after the seam is welded, the rim is placed on a special lathe where the excess material from the sidewalls is machined away uniformly. When building up the wheel, they can often be trued to greater accuracy than traditional rims. They give smooth braking even brand new, with no need for a break (brake) in period as with traditional rims. There is a potential drawback to this type of rim, though: If the alignment of the two ends is less than perfect at the weld, the machining process can leave part of the sidewall thinner than it was designed to be. This can cause the rim to wear out from braking friction locally sooner than it otherwise would. A type of track race, often running six days continuously. Teams of riders would take turns riding and resting. Each team would have a small stick, carried in the back pocket. As one rider would relieve another, the stick would be passed from one to the other in a distinctive maneuver designed to transfer as much momentum as possible from the retiring rider to his relief. This style of racing was most associated with New York's Madison Square Garden, hence the name. The Maes bend is the most common type of drop handlebar. From the center, it goes straight out then bends forward in a gradual curve. When it has bent forward 90 degrees, it turns downward, and bends in a smooth, constant-radius curve approximately 160 degrees, then straightens out. It is usually set at an angle such that the forward-bending section is tilted somewhat downward toward the front. The bottom flat part of the "drops" will normally be level, or slightly down at the rear. It should be adjusted for straight wrists when the hands are resting on the drops. In the bicycle world, especially the BMX and Freestyle realm, the term "mag wheel" is used to refer to molded glass fiber-reinforced plastic wheels, typically with 3-6 molded"spokes" as opposed to traditional wire-spoked wheels. The best-known brand is "Tuff Wheels". In the early days of BMX there were metal "mags" made of pot metal, such as "Lester Mags". As far as I know, nobody has ever made bicycle wheels out of magnesium. The term "mag wheel" is just a slang term for any type of molded one-piece wheel. "Mag" wheels are heavier than spoked wheels, and the rims can't generally handle high tire pressures, but the wheels themselves are very strong and resilient, good for abusive riding applications. Defunct French manufacturer primarily of brakes. The Mafac "Racer" centerpull was the standard for high-end French bikes all through the '50s and well into the '60s. A race in which all the competitors start together at the same time, as opposed to time-trials or pursuits. Mass-start races were illegal in Britain for many years, a major reason for the popularity of time trials there. A cyclist who habitually pedals hard in a high gear, at a slow cadence. The opposite of a "spinner." The "mashing" style is likely to cause knee injuries and leg cramps. A special chain link (actually, half of a link) designed to be easily disassembled and re-assembled. Most simple bicycles have these, but they are not generally used on bicycles with derailer gearing, because conventional master links are too bulky to clear the closely-spaced sprockets. The Craig Super Link, SRAM Power Link, KMC Missing Link and Wipperman Connex are special master links that work with derailer gearing, and a good choice for a cyclist who wishes to be able to remove the chain for cleaning. The article about chain cleaning includes more information about master links. A track event for two riders, who start together. Each rider would like to be behind the other for most of the race, because the rear rider has the initiative. As a result, most of the distance of a match sprint is covered at a very low speed. Suddenly, one of the riders attacks with a burst of energy, and the tempo changes from a slow cat-and-mouse dance to a full-out blast. This is the most popular track event, and is very exciting. An American manufacturer of brakes and brake shoes. Mathauser was an early producer of hydraulic brakes, and also made an unusual type of sidepull brake. Mathauser is best known as a manufacturer of brake shoes. They are a distinctive ugly rust-red color, but they are the best that I have come across. They provide excellent stopping power wet or dry, and are very long-lasting. I recommend them highly. Brake shoes using Mathauser's technology are also manufactured under license by Kool Stop. A traditional upholstered saddle, as used on older, less-expensive English 3-speeds (better models used leather saddles.) A mattress saddle has multiple small coil springs running along between the front and rear of the frame, covered with a layer of felt or horsehair, and a leatherette/vinyl top. This type of saddle almost always has large coil springs at the back of the frame. A major French manufacturer of parts. Mavic has long been one of the top manufacturers of high-quality rims. In the late '80's, Mavic started to branch out into other parts, including very well-received hubs and cranksets. For a more thorough explanation of mechanical advantage, see my article on Cantilever Brakes. Very old, established American manufacturer of bicycle saddles. This is the system of gear measurement most commonly used in Europe. Development (also known as rollout), is one of the three comprehensive systems for numbering the gear values for bicycle gears. Development is the distance the bicycle travels for one crank revolution, and is usually measured in meters. Development can be calculated by dividing the chainwheel size by the rear sprocket size, multiplying the result by the wheel diameter and by pi (3.1416). See also gear inches and gain ratios. A quick and easy way to convert from meters development to inches is to divide by 0.08. To convert from gear inches to meters development, multiply by 0.08.
International measuring system based on the meter (approximately 39.37 inches) as the unit of length. Metric bicycle parts and dimensions are usually given in millimeters (mm, 1/1000 meter) or centimeters (cm, 1/100 meter). Strictly speaking, the system of measurement now in use is called "standard international units". It is different in subtle ways that are unimportant to a bicycle mechanic. Most wrenches used on bicycles have sizes in millimeters. The most common sizes are 8 mm, 9 mm, 10 mm, 13 mm, 14 mm, 15 mm, 17 mm, 32mm and 36 mm; also, Allen wrenches in 4 mm, 5 mm, 6 mm and 8 mm. Less common are 7 mm, 11mm, 12mm 16 mm and 19 mm, 30 mm, 40 mm and Allen sizes 2mm, 2.5 mm, 3 mm, 7 mm and 10 mm. For example, the common "M5" thread used for water bottle mounts, cable anchor bolts, fender/rack eyelets, shifter mounts etc. on bicycles is more specifically described as "5.0 x 0.8", which specifies a 5 mm diameter, with threads 0.8 mm apart. Similarly, the common "M6" thread used for brake mounting bolts, threadless stems, many seatpost bolts and so forth is actually "M6.0 x 1.0" That's 6 mm diameter, threads 1 mm apart. To give another example, the common size for chainring stack bolts is 10 x 1.0 mm. This is a fine thread, not a standard coarse thread. It would be incorrect to refer to this simply as "M10" since the standard pitch for M10 is 1.5 mm. Metric threading is used for small parts on most bicycles. Larger diameter threads, however, such as headsets , bottom brackets and freewheels , are usually inch-based threads, most often 24 TPI . I have developed a color-coding system for quickly determining the size of a Metric wrench. This is explained in my article on Color Coding Your Tools. French spelling of "Meter ." Also commonly used in Great Britain and the Commonwealth. See also "centre "
Older-design seatposts were (and cheap ones still are) simple pieces of pipe, which a saddle clamp wrapped around. The part of the saddle clamp that wrapped around the post had a series of serrations or ridges which mated with a similar set of serrations on the parts that gripped the rails of the saddle. The saddle could be tilted up or down, but only in increments which would allow these sets of serrations to mesh. When seatposts with built-in clamps came onto the market, one of the major advantages that they were touted for was that you had a continuous range of angle adjustments, achievable by loosening the front bolt and tightening the rear (or vice versa). The buzzword to describe this feature was "micro-adjustable". This term came to become a general synonym for a seatpost with a built-in clamp, as opposed to the older "pipe" style. 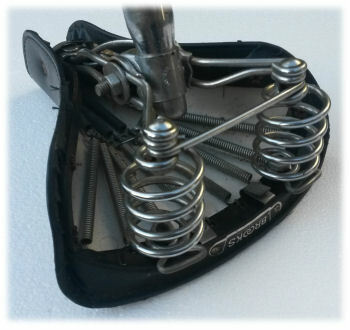 Most newer seatposts are single bolt designs, and rely on serrations to maintain the saddle angle (the serrations are finer-pitched than the old saddle clamps). Despite the fact that these seatposts do not provide a truly continuous adjustment, they are still commonly referred to as "microadjustable." Also see Laprade. For more on seatposts, see my article on Saddles. Sun Tour's buzzword for compact drive. A type of mass start race, usually on a track, sometimes on a criterium course. At each lap, the last rider over the finish line must withdraw, until there is only one rider left. This is also known as "devil take the hindmost." When one piece of tubing is to be fitted tightly against another, as in the joints of a bicycle frame, the tube to be added must have its end cut in a curved shape so that it will fit against the tube it is to be attached to. This curved shape resembles the ceremonial headgear of a bishop, and takes the name "miter" from it. A more prosaic name for this is "fish-mouth." The accuracy and precision of the mitering of the frame tubes is fairly critical. In the case of a lugged frame, a sloppy builder can usually get away with less-than-perfect niters, since the miters are mostly not visible, hidden inside of the lugs. Even so, the frame will be stronger if the miters are well fitted. With lugged frames, the quality of the mitering can often be judged by looking at the inside of the bottom bracket, where the seat tube, down tube and seatstay miters will usually be visible. A style of lady's frame in which the "top tube" consists of a pair of small diameter tubes running more-or-less straight from the upper head lug, past the seat tube, and on to the rear fork ends. A mixte frame thus has 3 sets of rear stays, instead of the usual two. A variant on the mixte uses a single, full sized top tube running from the upper head tube to the seat tube, but retains the middle set of stays. A lady's type bike that lacks the middle pair of stays is not a mixte. Mixte frames are stronger than conventional lady's frames, particularly in resisting the tendency of the seat tube to get pushed backward in the middle when ridden by a heavy rider. In French, "mixte" is pronounced "MEExt", but normal U.S. bicycle industry pronunciation is "MIX-ty". A major Italian manufacturer of brakes. Modolo was the first to offer "æro" brake levers on a commercial basis. Modolo also makes badly-designed handlebar stems. See John Allen's article on stems that invite failure . A metal commonly used in high-strength steel alloys, such as chrome-moly steel. Molybdenum is also used in some grease ("moly grease."). A type of adjustable wrench in which the jaws are perpendicular to the handle. A structure, such as a bicycle frame, built as a hollow shell, without an interior framework. The strength of a monocoque structure comes from the shell alone. Monocoque bicycle frames are uncommon, but have been made from carbon fiber and from formed sheet aluminum. An event in which a bicycle drafts behind a motor vehicle, usually a motorcycle. This was the most popular form of track racing in the 1920s and '30s. Special motorcycles called "Dernys" are used for track events. The motorcycle driver sits very erect and far back to improve the drafting effect. There is a horizontal roller mounted behind the rear wheel, so that, if the bicycle gets too close, the bicycle's front wheel will hit the roller, rather than a rigid part of the motorcycle. Some road racers train behind a motorcycle, which allows the coach to accompany the rider, and teaches the cyclist to be comfortable controlling the bicycle at higher-than-average speeds. Dr. Alex Moulton, noted automobile designer, was also a cyclist and bicycle designer/manufacturer. He was an early pioneer in the development of fully-suspended bicycles. The original Moulton bicycles of the 1960's had 16 x 1 3/8" (ISO 349 mm) wheels. The small wheels reduce unsprung weight, reduce the overall size of the bicycle, and allow luggage to be carried lower, lowering the center of gravity. The 349 mm size was originally a juvenile size, and the fairly wide, low-pressure tires limited the performance of the early Moultons. Later models, currently known as "Alex Moultons" or "AMs" use a slightly larger diameter tire/rim (ISO 369 / 17 x 1 1/4) developed specifically to Moulton's requirements. 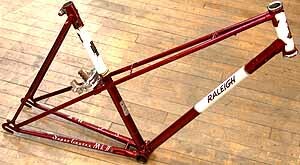 Early Moultons used a simple cross frame of large-diameter steel tubing, with a reinforcing strut for the seat tube. The current "AM" series uses a very elaborate "space frame", consisting of a network of many pieces of small-diameter steel tubing, lined together into a truss made up of many small triangles. AM models are designed to separate into two roughly equal-sized pieces for ease of transport. There is also an "APB" model with 406 mm (20") wheels. "Mountain bike" (MTB) is the currently-preferred term for bicycles made for off-road use. Mountain bikes use 559 mm wheels, or "29er" wheels which are 622mm wheels with wide tires; have at least 15 speeds, and usually have cantilever brakes or disc brakes. There was an attempt to make a copyright out of "MountainBike", but the term has become generic. Some have tried to promote the term "All Terrain Bike" (ATB) as an alternative, or to designate some subtle variant of the mountain bike, but this term has largely fallen into disuse. The mountain bike is in many ways a hybrid design, a cross between a BMX bicycle and a touring bicycle. A style of handlebar similar to an inverted North Road bar, but flatter and wider, with larger-radius bends. Usually supplied in "road" diameter (23.8 mm / 15/16") used with drop-bar type brake levers, often with barcons. Previously available in a smaller diameter (22.2mm / 7/8") for use with mountain bike-type controls. Designed by Grant Petersen, formerly of Bridgestone bicycles. This was standard equipment on the legendary XO-series Bridgestones. Drew Saunders has a Web document devoted to the Moustache handlebar. A triangular flap that hangs down below the front fender to protect the feet from spray. Sociable cyclists who ride in wet conditions sometimes have rear mudflaps to protect their companions. A bicycle with a disc brake in front, cantilever brake in back. This setup is somewhat common for single-speed mountain bikes , because the use of the rim brake in back permits use of a flip-flop hub.